Custom Embroidered Knit Caps, skull caps, beanies, fleece headbands. 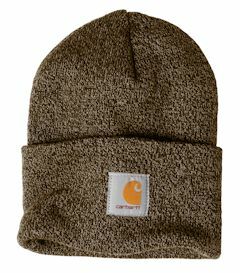 Custom embroidered Carhartt Knit Caps, Skull Caps and Fleece Headbands are essential to any business or group. Great prices offer you an easy way to promote, advertise year around. Not only keep you toasty in the winter with custom embroidered knit caps, skull caps and fleece headbands. Both offer a great way to promote you company or event. 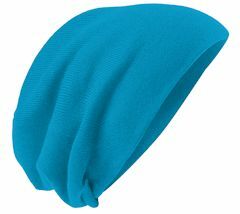 We offer a little bit of everything here, from the all time popular fleece headband by Port Authority to the fancy two color skull cap in awesome colors. Custom embroidered cuffed knit caps, skull cap beanies by TNT, Port & Company, Carhartt and Yupoong. Something for everyone. 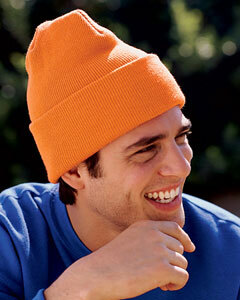 The basic cuff embroidered knit cap is always a daily favorite as well. Embroidered knit caps that are affordable and covers the head best for those really cold days. Custom embroidered C910 - Port Authority® - R-TekT Stretch Fleece Headband. Super plush, fantastic quality! 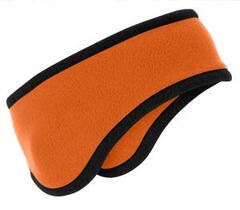 Fabric/Style: Constructed with 95/5 polyester/spandex fleece, this stretch headband is extremely soft with an anti-pill finish for long-lasting wear. A touch of spandex helps it retain its shape. The wide band provides ample room for your logo. Custom embroidery logo included! Sizes: ONE SIZE. Logo size limitations on embroidery is 1.25 H X 4 W.
*You may combine knits and headbands together if design is no larger than 1.25 tall X 4 wide. Lightweight, yet toasty warm, our solid fleece headband has a stylish black binding and is a welcome alternative to a knit cap. Fabric 100% polyester fleece, exclusive of trim. Custom embroidery logo included! Sizes: ONE SIZE. 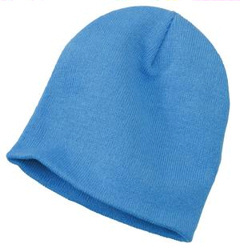 Logo size limitations on embroidery is 1.25 H X 4 W.
Custom embroidered Port & Company ® - Knit Skull Cap. CP94. With plenty of stretch for a great fit and shape retention, this cap has a modern clean look at a modest price. 100% acrylic. 7 1/2" wide X 8" tall. *You may combine all knit styles for quantity discounts. Custom embroidered Port & Company ® - Beanie Cap. CP91 . 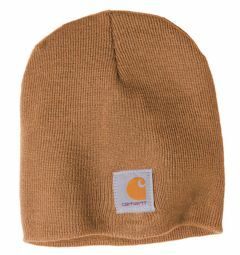 A warm must-have accessory, this beanie is available in a variety of solid colors or with a contrasting trim. 100% acrylic. 10" width X 9" tall. Custom embroidered 01500 Solid Acrylic Knit Cap. 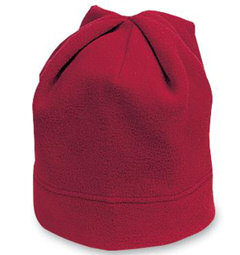 Traditionally this is a skull cap or beanie. Custom embroidered with your logo. Embroidery field approx 1.5 h X 3 w inches. 100% acrylic knit cap. Custom embroidery included. 1501 Yupoong Solid Acrylic Knit Cap With Cuffed Bottom with your custom embroidered logo. Approx embroidery field about 2X4 inches. Vareity of colors and great quality by Yupoong. 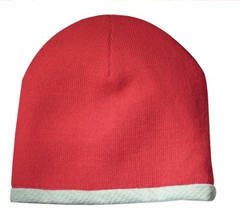 100% acrylic-knit cap with cuffed bottom. Custom embroidery included. For cuff embroidery, size limit 2" tall X 4" wide. 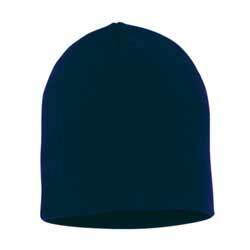 Top quality embroidered Port Authority ® - R-Tek ® Stretch Fleece Beanie. C900 . This plush hat is the perfect warm accessory for chilly days. An anti-pill finish gives lasting wear, while a 2.5-inch double-needle area is embroidery friendly. 95/5 poly/spandex R-Tek stretch fleece for warmth and shape retention. 10 1/2 " wide X 8 1/2" tall with 2 3/8 brim. Custom embroidery included. For best embroidery, limit design to 1.25 tall X 4 wide. Otherwise design will run over seam. 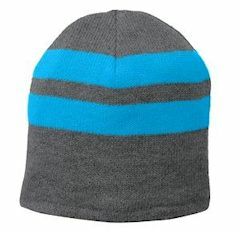 Top quality embroidered Port & Company® - Fine Knit Skull Cap with Stripes. CP93 . 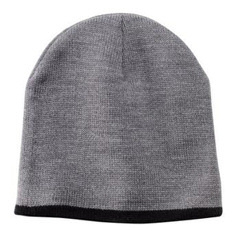 A fashionable and comfortable cap of fine knit that's incredibly smooth. 100% acrylic fabric for stretch and lasting wear. Features two upbeat contrast stripes, Year-round style. Custom embroidery included. 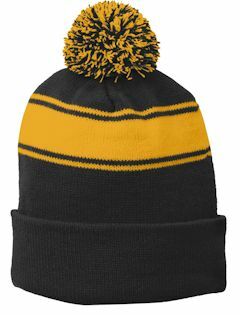 Available in several team colors with a raised double stripe, this beanie is perfect for any fan. Fabric: 100% acrylic. Custom embroidery included. 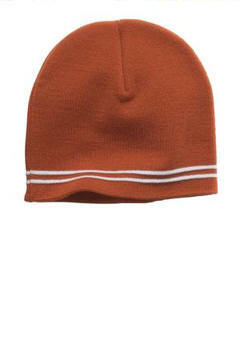 Classic stripes and warm fleece lining make this beanie a stylish cold-weather must-have. Fabric 100% acrylic with 100% polyester fleece lining. Custom embroidery included. One size fits most. 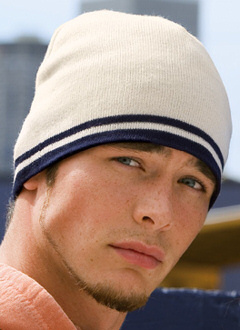 Keep a cooler head in this knit cap that features a textured moisture-wicking lining. Fabric: 60/40 cotton/acrylic, 100% polyester lining. Custom embroidery included. One size fits most. Custom Embroidered Carhartt ® Acrylic Knit Hat. CTA205. 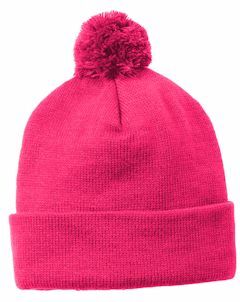 Warm and snug, this beanie comes in enough colors to wear a new one every day of the week. Embroidered logo can be sewn on the sides or back of this knit cap.